In 1946, Emmett helped fight for a promised state bonus to be paid to WWII veterans. The bonus was not substantial — $10 per month to soldiers who were in the military but stayed in the states, $15 per month if the soldier fought overseas, and $900 to the beneficiaries of anyone killed in the war. Although individually the amount was small, with nearly 1 million veterans in Illinois, the total bill was projected to come to $385 million. This was the largest spending bill in Illinois State history. With state budgets tight, a political wrestling match was fought over where the money would come from. In the eyes of vets like my father, the battle was a political quagmire. The chief opponent in the state was Mayor Ed Kelly of Chicago, who would gain fame for reducing the debts of the City of Chicago by $100 million, but would also have scandals dog him until the end of his reign as mayor. 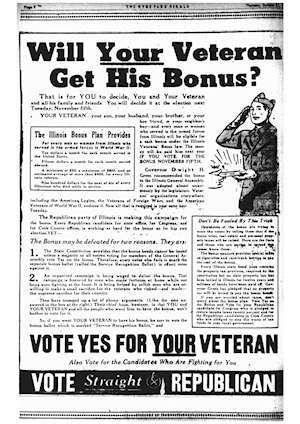 “If the members of the armed forces of the State of Illinois are to receive the State bonus which will amount to $385,000,000, they will have to register before next Tuesday and then be sure to go to the polls on Tuesday m November 5th, and vote for this measure,” declared Captain Emmet Gibson of the 192nd Tank Battalion here this afternoon (Friday, October 4th). Addressing more than one hundred members of his Veterans Bonus Non-partisan Committee in the Bismarck Hotel, Gibson a survivor of a tank battalion which was practically wiped out on Corregidor , said: “The Kelly City Hall machine is spreading all sorts of propaganda as to why people should vote against the bonus issue. The fact which bothers Kelly and his gang is the knowledge that this money will be paid out by Republican State administration which originated the bonus, and he is afraid that in gratitude for this well-earned bonus we veterans will vote against the Mayor. Continuing, Gibson said: “We veterans have tracked down the falsehoods that the Kelly crowd is telling the voters. They are telling the taxpayers that their real estate taxes will be increased and all kinds of other lies. Kelly is a smart politician in the eyes of some people, but he wasn’t very smart to pick a political fight with the Veterans of World War II. Continuing Captain Gibson said: “If anyone else but Kelly opposed our bonus, it might be different, but here is a man who has been at the public trough all of his life. Kelly is part and parcel of the New Deal, which has wasted and squandered not only millions of taxpayers’ money but billions upon billions of it. After we sacrificed our homes, our lives and our loved ones, Kelly starts a whispering campaign to defeat our bonus measure. The measure was on the November 5th, 1946 ballot. It passed overwhelmingly. Republicans also made tremendous inroads into Cook County offices during the same election. Kelly left office in the next election in 1948.